stored. This plan is significantly more expensive for anyone with a lot of data. features, such as account administration. Options tab with 15 checkboxes for notifications, daily preferences, etc. Positioning: Mozy is the industry-leading solution for online backup – back up your important files, photos, documents and more over the internet. Sales channels: Primarily direct to consumer. Affiliate and reseller programs. Mozy Home: $4.95/mo per PC. 1 year paid up front: Get one month free. 2 years paid up front: get 3 months free. Our guess is that the typical Home user has 15GB of data backed up for $4.95/mo. Using Mozy Pro, that would be $3.95 plus $7.50, or $11.45 per month. If you have 100GB of photos or music, you definitely want to use Mozy Home! The signup process for Mozy is simple. To register for a free 2GB account, all you need is an email address and password. Purchasing is also simple and straightforward. One nice thing about Mozy’s shopping cart is you can buy multiple licenses with one transaction. The installation of the PC software was quick and easy. As part of the setup, you are asked whether you want to let Mozy keep your encryption key or whether you want to keep it yourself. This could be useful for healthcare organizations or law firms where either convention or legislation require you to keep your own encryption key. Consumers beware, however: if you keep the key yourself then lose it, you can kiss your backup goodbye. Wisely, Mozy recommends that they keep your key. The good news is if you check “Photos and Images” for example, Mozy will find your photos no matter where they are. However, all of this complexity is unnecessary if you’re selling unlimited backup space– it should just start backing up everything by default. So our guess is that the idea of “unlimited” backup was an afterthought because this interface is what you would design if you were selling a limited amount of space. After selecting what you do and don’t want to back up, Mozy tests the speed of your Internet connection and gives you a rough idea of how long your initial backup will take a nice touch as most people don’t realize how slow DSL and cable modems are at uploading. You then get to choose how much bandwidth you’re going to devote to backup with a little slider that says “Faster Computer” and “Faster Backups”. Your estimated time to complete will change accordingly. This feature will totally baffle a novice who doesn’t understand where they should set this control and why. When you’ve made all your selections, you can start the initial backup. Unfortunately, in our case, Windows froze after pressing Finish. We needed to force-quit Windows and restart. After a restart, Mozy kept running and did a good job of monitoring CPU usage and scaling back when the computer was in use. An email to customer support concerning this problem went unanswered. If you’re using the free 2GB service, you have to keep an eye on your quota — if you go over 2GB, your backup won’t start until you eliminate something. The pop-up says “future backups may not complete”. It should say “will not”. If fact, they won’t even start. Fair enough it’s free, after all. This “History” button lets you see all your past backups. We are not sure what a user would make of this. For example, the 3rd file down on this list shows “Size Encoded” as 3.1MB and “Size Transferred” as 1.6MB. There’s probably a good explanation for what this all means, but it would surely not mean much to the average consumer. When you click the “Configure” button (you would have to do this if you needed to reduce the size of your backup, for example), you get the same kind of screen that you saw initially for picking what you do and don’t want to back up. We were surprised that it took 60 seconds for this screen to appear, however. The Options tab brings up a bewildering selection of options that only a developer at Microsoft could love. Most consumers wouldn’t have a clue what to do with most of these. In a product review in the Wall St. Journal last year, super-geek technology writer Walter Mossberg decided he liked Mozy best because of the extra control it gave him. This is the sort of menu that he must have been referring to. With Mozy you can restore files using just a web browser– a nice feature if you’re away from your computer and you need to get at something you’ve previously backed up. Like the rest of the Mozy web site, everything is clean, attractive, and well-organized. One issue you should be aware of with web-based file access is that Mozy must decrypt your data at their data center and send you unencrypted files. Don’t know how you feel about letting the vendor decrypt your files and send them over an un-secure link, but it makes us a little nervous. This is true for any web-based remote access feature, not just Mozy. 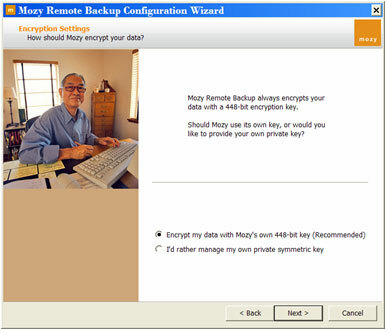 So unless there’s an emergency need, we’d prefer to use Mozy’s client software which decrypts the data locally. You then select the files that your want to restore using a folder tree structure that is similar to what you’d see with Windows Explorer. When you’re done, you click “Submit” and your request goes off to Mozy. You can select whether you want to restore the selected files to your computer or have them mailed to you via Fedex on a DVD for roughly $65. The web restore process is a little complicated. You get an email from Mozy saying that the selected files are ready to be downloaded. Then you go to the web page that shows your downloads. Your files are returned to you as a .zip file. We think most consumers aren’t ready for this. Even if they know how to unzip a zip file, you then have to know where you want to put the restored files. It does work, however, and if you don’t have a problem with zip files, then this should be ok.
We didn’t test restoring our whole backup, but we suspect that the web interface is mainly for retrieving individual files. We can’t imagine how you’d deal with, say, a 10GB zip file. The chances of a successful download are probably slim. We tried it with a 2.8 GB download and the download stalled at 32%. Tech support suggested we restart the download and said that any hiccup in the communications during the download will cause the restore to freeze. The web restore is also inexplicably slow: Mozy’s UI was indicating that it would take 9 hours for 2.8GB. That’s only 86kbps and the bandwidth in our office is more than 20 times that speed. The “clunkiness, unreliability, and slowness of a big restore might explain why Mozy offers the Fedex DVD option. It shouldn’t be necessary: even a consumer-grade DSL connection gives you 2-3mbps download, which means you should be able to restore 20-30GB per day no problem. So we wouldn’t think that Fedexing a DVD would normally be the desired solution, especially at a cost of $65. A quick Google of “Mozy restore” will indicate that the problems we encountered with the web interface at not isolated incidents. 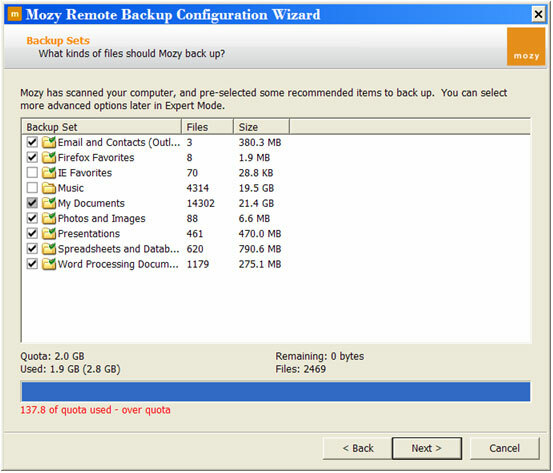 Using the Mozy PC client to do big or complete restores is a better way to go. This is the easiest, quickest, and most efficient way to restore files with Mozy. Using Windows Explorer, you can right-click files or folders to restore them to their original locations. You can also “Restore-To” any location as any file name. The “Explore” option is more cumbersome, but shows the parallel Mozy file structure as a network drive. In our tests, it was very quick for individual files or folders. The whole process was error free, easy, and efficient. We were able to restore a 2.8 GB backup in 7 hours 46 minutes. That represents a download speed of 850kbps. That’s a lot faster than the web download, but still a lot slower than the typical DSL or Cable is capable of. Restored files were put back in their correct locations. Canceling and restarting a restore operation takes a good 15 minutes or so, since the Mozy client doesn’t seem to be very happy about responding to cancel requests. But normally you wouldn’t do that unless you had started the request in error. Shutting the computer down in the middle of a backup raised some issues. There was no warning message or error message. It did not, for example, ask you if you want Mozy to complete the backup and then shut off the computer for you. A partial backup did not show up in the log file, even a failed process. So it is unclear whether anything was actually backed up. Mozy has a great web site. It’s pretty simple to do backups, especially if you consider yourself PC literate. Overall, it does a nice job. And having a 2GB free account has been an awesome deal for a lot of people who only have a small amount of stuff to back up. Our guess is that Mozy is very aware of these problems and we hope that they’ve got a plan to fix them in the near-term. And clearly not everyone has problems. There are far more positive comments about Mozy on the Internet than there are negatives, though we couldn’t find anyone with anything positive to say about the restore process. All in all, Mozy is one of only a few companies in the market with enough customers and stability that you can believe they’ll weather the growing pains. We think this market will eventually belong to Mozy and Carbonite and both will prosper and co-exist — Mozy with their free offer and strong support among the technorati and bigger enterprises, and Carbonite with their “backup for everyone” approach and big-name endorsers (like Kim Komando and Howard Stern). Click here to sign up for Mozy. There was an error while restoring. There was an error processing your restore request. Please try again later. I’ve been trying for hours now. And this isn’t the first time this happened to me. A couple of months ago I tried to restore and I had the same problem. I eventually gave up and got the files off of my wife’s computer, where I had still had them backed up from before using Mozy. So yeah, their service seems great when you first start using it. Nice little program, runs automatically, etc. But if you need to actually restore your files, WATCH OUT. It might take a LONG time. Oh yeah, and they don’t have live tech support either. You have to e-mail and then wait…………probably until the next business day. I’m definitely canceling my subscription after I get my data back. I’ll try somewhere else next time, or back up to an external drive and keep it offsite. Thank you very much for the review. I actually did what you described, jumped on 2 Gb. trial version then decided to move forward to Unlimited version. However, I couldn’t make payment through Mozy website. I tried all my credit cards and I was even worried at some point that these guys are fake and taking all the credit card information from you. It sounds freaky but it was just a moment. Then I contacted with Mozy home support at support@mozy.com they responded back after 16 hours sayings, “If the card is it should go through.” I was like WHAT?! I explained the situation clearly in my email and response was ‘it should work.’ I replied back to them saying, I tried all my credit cards which are also associated with my paypal account and all online websites. Also added, if you will respond with ‘it should work, dont bother’ so they didn’t bother and they didn’t reply back to me So I went ahead and started with Carbonite. I’m backing up all my data and sign up for their yearly service soon. Thanks for the review, I was worried if I’m making mistake but apperantly I did the right choice, good bye Mozy. 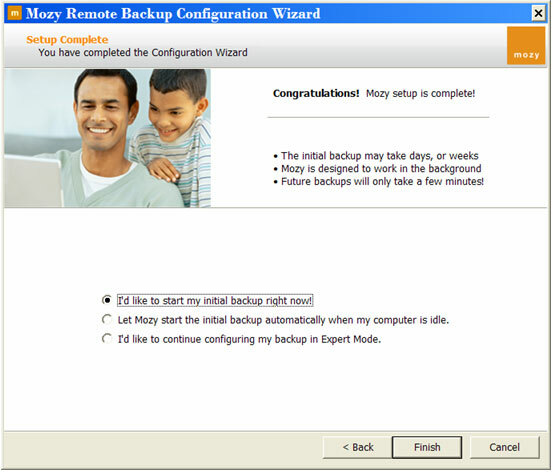 When we went to update on online backup product we took a close look at Mozy. These guys are great a marketing and have a fair backup solution as well. It’s kinda like a highly controlled Rsync Backup. Given that we are more about giving customers the best and not so much about the slick marketing we went with just Rsync. Lets face it, this is an application used by the big guys, it works and works well over the Internet and it does more than just backup. With Rsync restore works just like backup, no web interface and no problems. If you are reading this because you are looking for some kind of onlinebackup solution ping me over on our website’s chat box and we will be happy to setup a free rsync you can try with no strings. Great article. I’ve used Mozy and a couple others. I don’t like talking negatively about any service in public, but I ended up going with a service called “Tomahawk Backup” because it allows you to backup locally to a USB/Network drive AND off-site at the same time (Having both is important to me but I didn’t want to use two different apps), and they don’t throttle your bandwidth that I can tell. It’s middle of the road in terms of price but worth the few dollars a month extra to me. The interface can be a little clunky but not unbearable, and once it’s set, no need to access it often. Oh and they answered the phone when I called! I also use and really like SugarSync for syncing my laptop, work, and home computers. It has a few quirks but serves it’s purpose relatively well! Good article. Alot of these issues have come around in the industry. Especially, the restore problems mentioned here. I’ve been using backazon online backup to Amazon S3 servers. Secure and it’s versioned so if i delete a file on accident, I can look in an old backup. Admin Note: This Eric guy is an employee of Backazon. Mozy is one of the top companies in the business for sure. I’m amazed that they overnight you all your data on DVDs. That’s what I call service. As far as functionality, I think Carbonite beats all but that’s also the reason why it’s so hard to set it up in the first place. You might want to update this review. Since this was originally published they have released version 2 for Windows. It makes backing up faster, plus it has the ability to backup to a local drive. Most recently of course Mozy has also removed their unlimited data backup plan and replaced it with a 50gb and 125gb plan. I had the worst customer experience of my life with Mozy. After installing a mandatory software patch, I thought the backups were running as usual. Three weeks later, my hard drive crashed. After two frustrating hours on of getting the run-around with their customer service folks online (just terrible, terrible customer service), I had it in writing: you have no back-ups for the last three weeks, and it’s your job, as the customer, to log in regularly to make sure the back-ups are working correctly. I also had it in writing from the Mozy agent that my last back-up was Feb 4th (the date of the software update), and that it would be kept indefinitely. So I recycled my computer, which takes a few weeks, bought a new computer and went to download my files– they were gone. Completely gone. Turns out she had given me false information, and my files from Feb 4th were automatically deleted 30 days later, despite the fact that I had asked “Will my files be deleted after thirty days?” and she responded “No, that’s your last back-up and your files from Feb 4th will be kept indefinitely. You can wait to restore until you get your new computer.” Worst of all, Mozy refused to admit fault — to the bitter end, they claimed the back-ups were working correctly– and refused to give me my money back! They wouldn’t even give me a phone call. I don’t care about the $50, I care about the lost hours of my life spent wrangling with them, and all the lost baby pictures, music files, the manuscript of my book, and my masters thesis. Mozy.com is unreliable and unprofessional. What’s the point of a back-up service that doesn’t back-up your data reliably? MozyPro. Failed backups when notified successful by email. Two “glitches” that resulted in backups failing (no notification of failure). Customer service did try but unable to resolve before we left them.